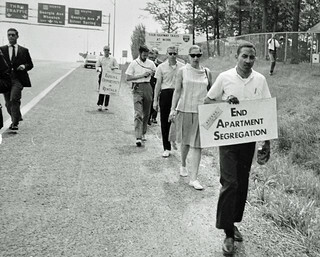 J. Charles Jones leads Access Coordinating Committee to End Segregation in the Suburbs (ACCESS) members on a 66 mile walk around the Beltway starting June 8, 1966 at Georgia Ave. The protesters were demanding that dozens of large, affordable apartment complexes in the Washington, D.C. suburbs open their doors to African Americans. During the four day march through rain and heat, they received many indications of support. However, integration opponents also threw objects at them and swerved autos in their direction. Jones led demonstrations for a year in nearly every county in the Washington suburbs, including sit-ins, marches and picketing. The longest fight occurred at the Buckingham Apartments in Alexandria. 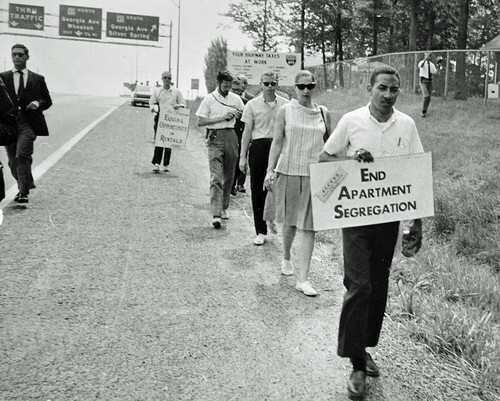 While the publicity engendered much debate and raised the issue in public consciousness, the actual number of apartment complexes that began admitting African American renters as a result of the protests was small. The federal 1968 Civil Rights Act finally prohibited most instances of discrimination in housing. Prior to the federal act, Maryland voters rejected an open housing law by referendum in 1967. Jones was a veterans civil rights worker who was a leader in the 1960-61 efforts to desegregate Charlotte department stores and was a freedom rider in 1961. After receiving his divinity degree from Howard University, he returned to Charlotte where he remained active in civil rights issues. Photo by Gene Abbott. Courtesy of the D.C. Public Library Washington Star Collection © Washington Post.